I was in Montreal last week for a conference on tax competition, where I participated in a debate about whether the corporate income tax should be abolished with my crazy left-wing friend Richard Murphy. But I don’t want to write about that debate, both because I was asked to take a position I don’t really support (I actually think corporate income should be taxed, but in a far less destructive fashion than the current system) and because the audience voted in favor of Richard’s position (the attendees were so statist that I felt like a civil rights protester before an all-white Alabama jury in 1965). Instead, I want to highlight some of material presented by Kansas Governor Sam Brownback, who also ventured into hostile territory to give a presentation on the reforms that have been implemented in his state. Here are some slides from his presentation, starting with this summary of the main changes that have taken place. 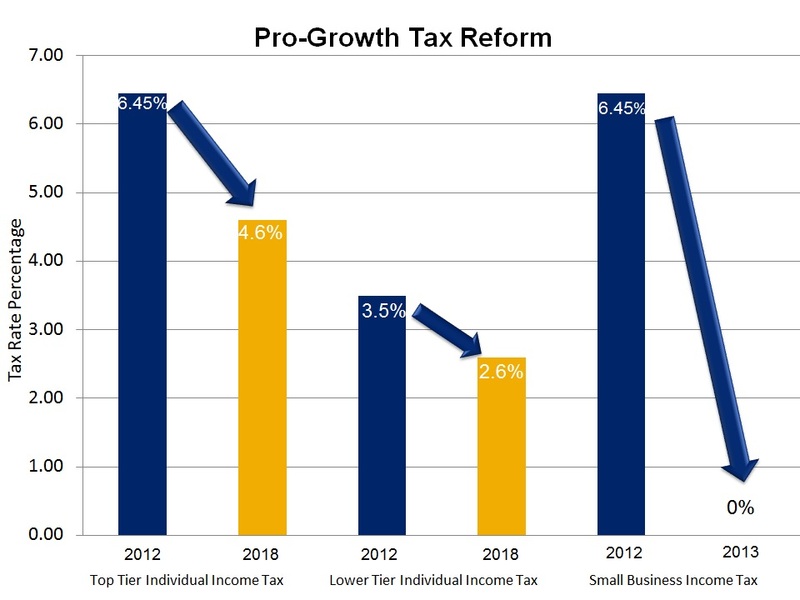 As you can see, personal income tax rates are being reduced and income taxes on small businesses have been abolished. By the way, I don’t fully agree with these changes since I think all income should be taxed the same way. In other words, if there’s going to be a state income tax, then the guy who runs the local pet store should pay the same rate as the guy who works at the assembly plant. But since the Governor said he ultimately wants Kansas to be part of the no-income-tax club, I think he agrees with that principle. When you’re enacting laws, though, you have to judge the results by whether policy is moving in the right direction, not by whether you’ve reached policy nirvana. And there’ no doubt that the tax code in Kansas is becoming less onerous. Indeed, the only state in recent years that may have taken bigger positive steps is North Carolina. In any event, what can we say about Brownback’s tax cuts? Have they worked? We’re still early in the process, but there are some very encouraging signs. Here’s a chart the Governor shared comparing job numbers in Kansas and neighboring states. These are positive results, but not overwhelmingly persuasive since we don’t know why there are also improving numbers in Missouri and Colorado (though I suspect TABOR is one of the reasons Colorado is doing especially well). 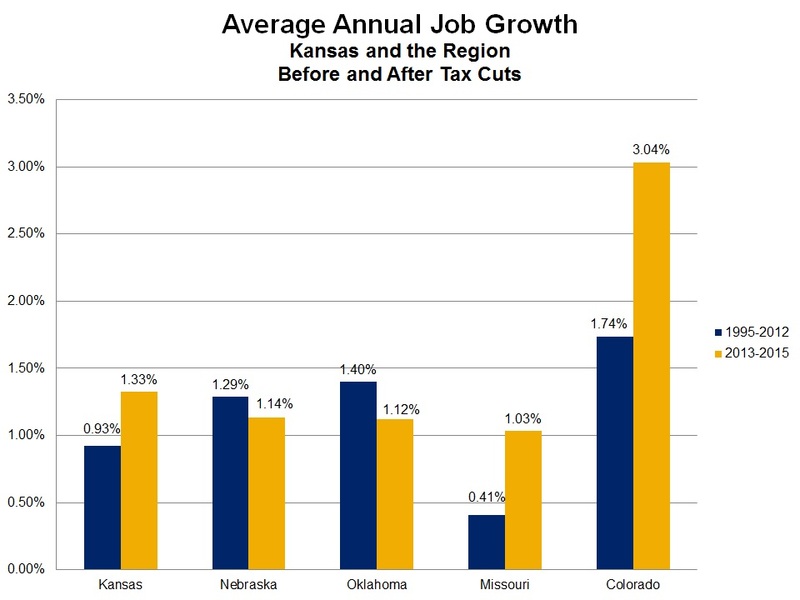 But this next chart from Governor Brownback is quite compelling. 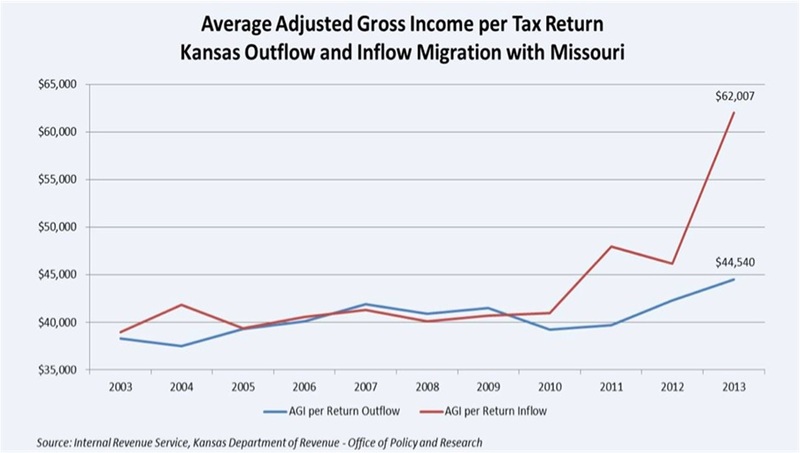 It looks at migration patters between Kansas and Missouri. Traditionally, there wasn’t any discernible pattern, at least with regard to the income of migrants. But once the Governor reduced tax rates and eliminated income taxes on small business, there’s been a spike in favor of Kansas. Which is particularly impressive considering that Kansas suffered a loss of taxable income to other states last decade. But here’s the chart that is most illuminating. In addition to being home to the team that won the World Series, Kansas City is interesting because the metropolitan area encompasses both parts of Missouri and parts of Kansas. So you can learn a lot by comparing not only migration patters between the two states, but also wage trends in the shared metropolitan area. 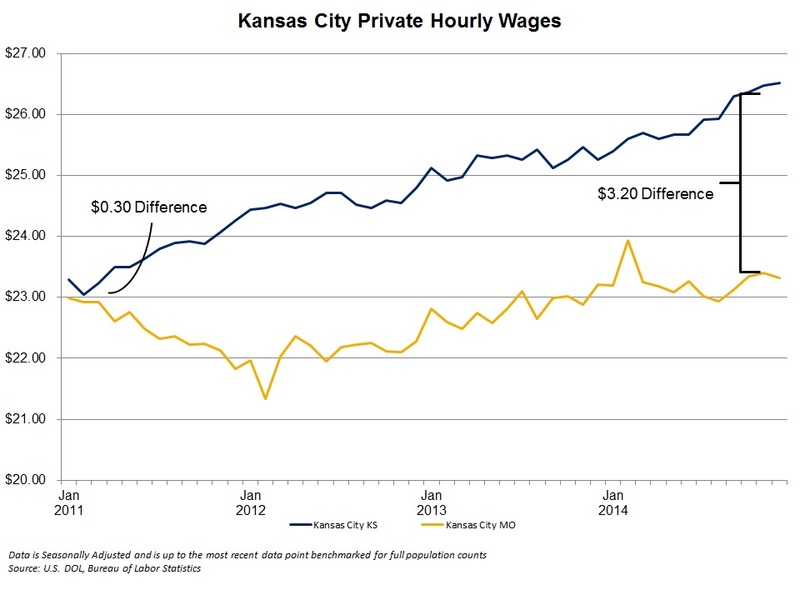 And if this chart is any indication, workers on the Kansas side are enjoying a growing wage differential. Like with all issues, it would be wrong to make sweeping claims. There are many issues beyond tax that impact competitiveness. Moreover, we’ll know more when there is 20 years of data rather than a few years of data. That being said, Kansas clearly is moving in the right direction. All you have to do is compare economic performance in Texas and California to see that low-tax states out-perform high-tax states. Indeed, if Kansas can augment good tax policies with a Colorado-style spending cap, the state will be in a very strong position. P.S. This joke also helps explain the difference between California and Texas. Too bad the Kansas governor isn’t running for the white house … or is s/he? There are still so many in the race, that I might have missed someone. “Certain contract laborers who receive 1099s” is a far, far cry from “small businesses”, and I really am tired of Brownback and his opponents (one to claim credit and the other to demonize) pretending otherwise. By no means and in no way did Kansas stop taxing small business income.